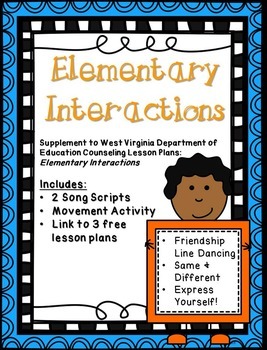 This is a supplemental set for the lesson entitled "Elementary Interactions" from the West Virginia Department of Education School Counseling Curriculum. -Friendship Line Dancing: Students will demonstrate various friendship skills with a partner. -Same and Different: Students will be able to name ways they are alike and different from their peers. -Express Yourself! : Students will be able to express their feelings appropriately through class discussion and a handout. This set comes with 2 song scripts and a movement activity. The link for the free lesson plans are included on the credit page.